In a capitalist society, banks that hold the right to issue currencies and siphon profit out of citizens’ pockets are often criticized as the root of all evils. Paper currency was an exchange ticket for gold and silver inside the vault, but now, as symbolized by banknotes issued beyond the amount stored, it can be said that banks became sort of public fraud rings. 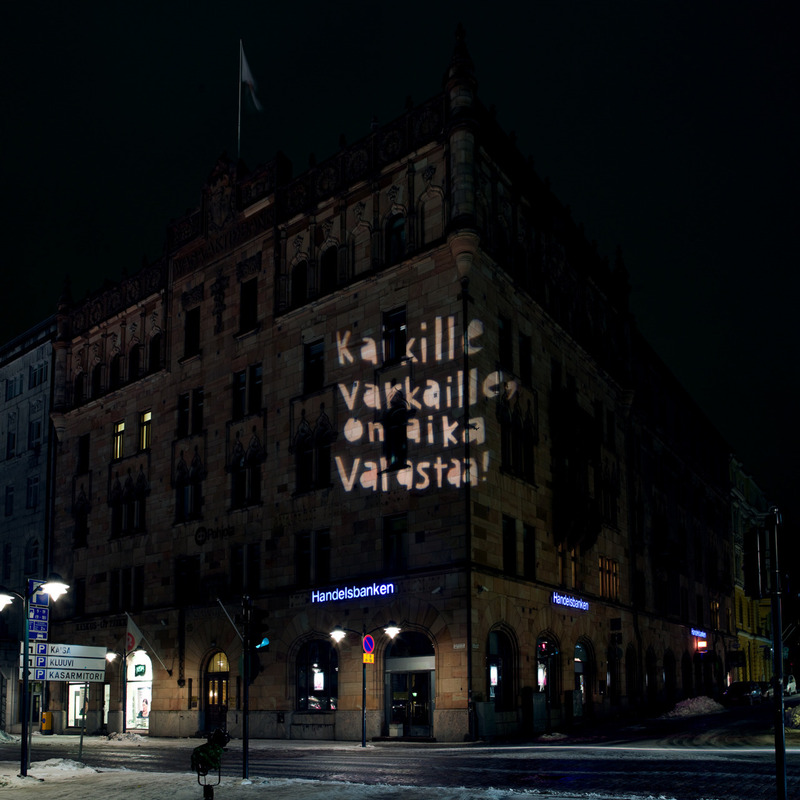 In this project, Niwa recorded as his video work a guerrilla activity of projecting a message that says “Fellow robbers, now is the time to steal!” with a large-scale illuminated sign on buildings of various banks across Helsinki at night after closing times. By making some gesture towards communication with thieves who are violators, this work suggests a correspondence with those who lay dormant in a collective group. The people who saw the sign are likely to imagine not only an act of resistance against possession in a capitalist society but even all levels of theft in everyday life. This work was produced during a residency at the HIAP Residency Programme, Helsinki.